Using software on the chip itself, figure out how fast the DCO really is. Auto adjust baud divisor based on DCO speed. Create a chart of all the DCO settings (further down on this page). Compare difference in the DCO speed from two microcontrollers with the same part number. Test the DCO during a temperature change (in a freezer). Prove Bluetooth and BLE signals can travel through the walls a refrigerator. I posted my source code to do the calibration at the bottom of this page. Other people may find it useful for their own projects for adjusting their baud rates based on the DCO speed. 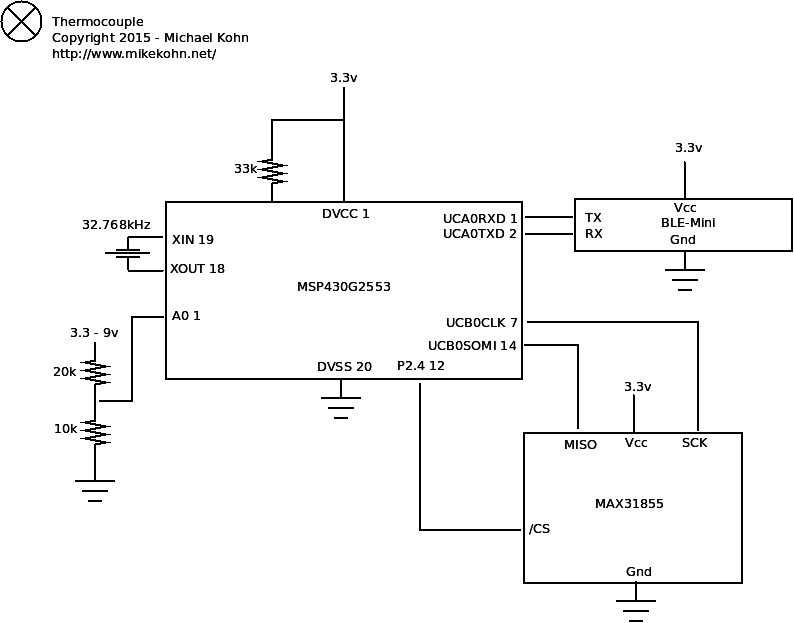 I did another project with a similar DCO issue a few months ago: MSP430 VGA with Java. This one used an MSP430F5529 to generate a VGA signal originally with the DCO and the MSP430's built in 32.768kHz crystal calibration which did create a VGA signal, but with a ton of jitter. I ended up fixing it with a real 25MHz crystal. 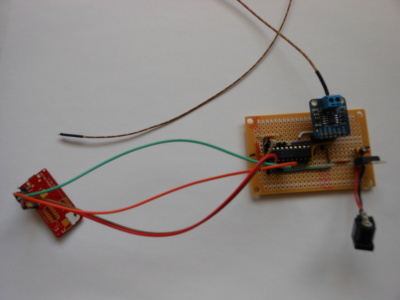 This is the thermocouple circuit with the RedBearLab BLE-Mini and a K type thermocouple. Since there is no guarantee when setting the DCO that you'll get the frequency you think you're getting, what I've done in the past while using the MSP430's UART is... well first of all I wouldn't run anything above 9600 baud. Then I would calibrate my code for the chip I'm using by looking at an output pin of on an oscilloscope, figuring out how far off my DCO is from that, and adjusting my baud rate constant for this specific chip. If I blew the chip and needed to program a new one, I had to recalibrate my code again. I actually did think about using an Atmel ATtiny2313 (one of my other favorite chips) for this project with a 20MHz crystal or even just using a built in clock source which is still much more accurate than the DCO, but I really like the MSP430's debugging and programming tools. 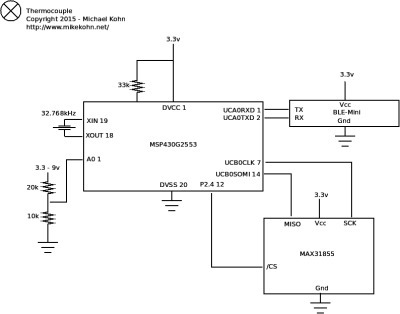 Also worth noting: according to the msp430x2xx user's guide, the baud rate generator can use a 32.768kHz crystal to get up to 9600 baud, but I haven't tried this yet. The video above shows this circuit connected over BLE to an iPod touch next to my older thermometer project connected with Bluetooth 2.0. I put both in the freezer proving that the Bluetooth and BLE signals are strong enough to go through my refrigerator walls and that the the DCO appears to be stable during this temperature change. Also, it's interesting to note how much faster the thermocouple reacted to the temperature change vs. the DS18B20. In order to figure out the speed of the DCO in software I connected a 32.768kHz crystal to Xin/Xout of my MSP430. I set up Timer A and Timer B so that Timer A interrupts every 512 cycles and gets its clock source from the DCO. Timer B interrupts every 32768 cycles and gets its clock source from the 32768 Hz crystal. Therefore Timer B should interrupt once a second and tell how many DCO interrupts there were in that interval. Multiplying the number of DCO interrupts by 512 (aka, binary shift left by 9) should tell how many CPU ticks there were, maybe off by 511 cycles or so. I wrote some code that would do this multiplication saving the result into 4 bytes of memory and then dividing this number by the baud rate I want. In the thermocouple circut I did this at the top of the program once. There is also a modulator selection, which gives a frequency between two DCO frequencies. For example in my case where RSEL=15 / DCO=4 I get 14.754MHz and RSEL=15 / DCO=5 I get 15.981MHz. Using the modulator (a value between 0 and 32) I should be able to get some frequencies in between DCO_4 and DCO_5. I've never used this setting before. Source code assembles with naken_asm.